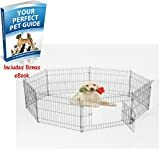 Lightweight And Easy To Assemble Pet Cage 8 Panel Metal Small Fence 24-Inch – Suitable For Dogs, Cats, Chicken, Pig, Guinea, Rabbit And Hutch – It Provides Cozy Room For Pets Playing And Relaxation – Includes BONUS Ebook Series ‘YOUR PERFECT PET GUIDE BY E-COMMERCE EXCELLENCE’. There are 8 steel panels connecting with metal buckles. Each panel can be fixed with ground pegs. The Door has 2 bolts for secure locking. It is suitable for being used as a secure play area where your pets can play and jump outdoors without worrying. -Enclosed spaces they can run into: Tunnels appeal to cats’ natural instinct to hide in mysterious places – enclosed spaces offer security and shelter from predators while they stalk their prey. -Things that make crinkling and rustling noises: Some cats nap inside for warmth while nervous kitties use it to escape from possible attention. Others just love sprinting through and playing ‘hide and pounce’ with their brothers and sisters. We’ve built on the instinctual appeal by adding a crinkly centre ‘peep hole’ which allows for multi-cat play and creates intriguing noise. 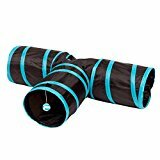 -Dangling ball-toys to swat and bat around: Combine this tunnel with cat charmers , treats, balls or toys for a whole new level of fun that will have your cat stalking, pouncing and racing about to burn off those calories. 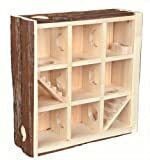 -Easy to use,carry,store which could fold as a small size for storage, travel, or when you want to put a few toys away while company visits..
-Give your cat or pet more care by using it through the hide and seek game which could make you more close.Cat play tunnel,cat tunnel 3 way toy. -Light weight and durable. Made of polyester and metal circular linings at each end.